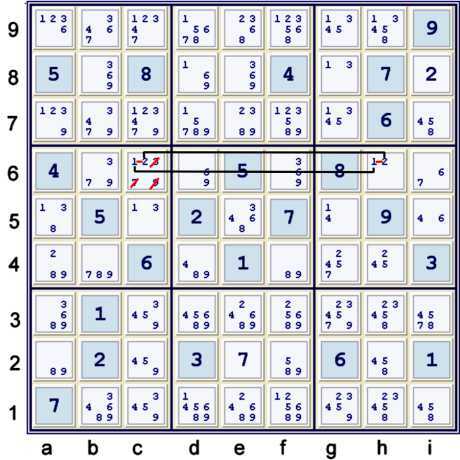 The following illustrated proof for the Tough Sudoku of April 10, 2007 employs exactly three Sudoku techniques: Hidden Pairs, Very Common Y Wing Style, and Coloring . Any technique that uses exactly one type of candidate to justify an elimination I call Coloring. Many steps not illustrated are possible. To show every possible step is, well, just overkill. However, this page illustrates sufficient deduced elimination steps to both solve the puzzle, and also to prove a unique solution. Typically, at this point, and more so if I am solving the puzzle on paper, I prefer to search for Hidden Pairs before filling in the Possibility Matrix. I am probably in the minority in this regard! c6=1 == h6=1 -- h6=2 == c6=2 => c6=12. One can at this point make many other eliminations. However, cell f4=89 and cell a2=89 is a signal that a very easy to use and spot elimination may be available. There is always a proof by contradiction available for every possible elimination. 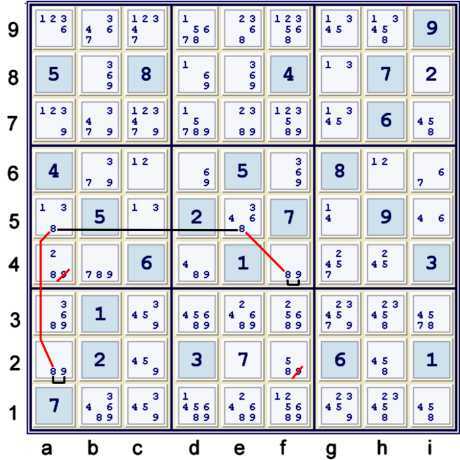 However, the goal of most Sudoku techniques is to find eliminations by recognizing some sort of pattern. As such, this pattern is very easy to identify. 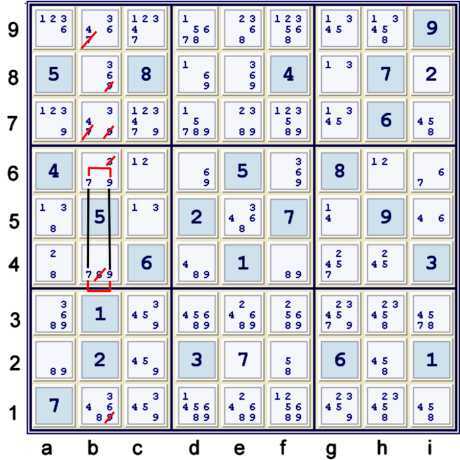 Nevertheless, I have not seen this pattern well utilyzed in other sites describing tips, tricks and techniques to solve Sudoku puzzles. I call this pattern a Very Common Y Wing Style because the logic is analagous to a standard xy Wing or Y Wing, and the pattern is fairly prevalent. In my opinion, it is more prevalent than a standard Y wing, and it is easier to find! Many puzzles are designed to be solved using a Y Wing, but few are designed to be solved using the Very Common Y Wing Style. 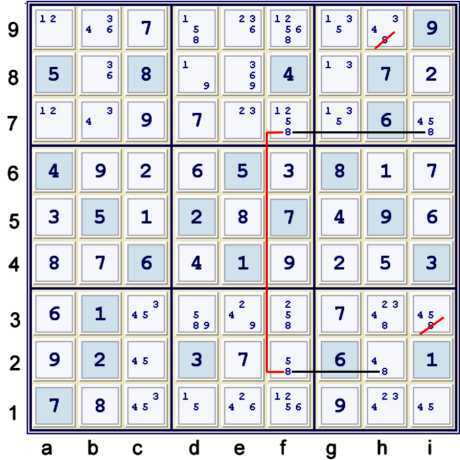 Nevertheless, despite the fact that the pattern is not designed to exist, it is still occurs with enough frequency that it should be standard issue in any Sudoku Toolbox. In my experience, I have found many puzzles designed to be very difficult that are trivialized with this technique. Hopefully, I have driven this point home! Perhaps, if this technique had a more catchy name, it could be included in the standard issue Sudoku solving list. Feel free to suggest such a name! It is quite likely, however, that this technique already has a name given to it by the Sudoku community. If anyone can identify that name, please let me know. Then, I can call it by its proper name. This elimination group causes a cascade of Unique Possibilities, beginning with b1 = 8% column. If you find all the hidden singles and naked singles that result from this cascade, you should arrive at 49 cells solved. (UP 49). Again, one can arrive at a proof by contradiction by considering What if h9 or i3 are 8? However, most prefer to find this elimination by recognizing the pattern caused by the relative configuration of candidate 8 in rows 2 & 7. After making the eliminations noted above, the puzzle is reduced to another progression of Unique Possibilities, this time until the puzzle is complete. Start with i7 = 8% column and box, then h9 = 4% column and box. Naked singles are then available to the end. Rating based upon this proof: 3(.03) + .07 = .16 A very easy tough. 1) Start at 22 filled. UP 24. 2) b4=7 == g4=7 -- i6=7 == i6=6 -- d6=6 == d6=9 -- f4=9 == f4=8, forbids b4=8. UP 27. 3) locked 3's at c13, forbid c5679=3. UP 49. 4) d1=1 == d1=5 -- i1=5 == i1=4 -- h2=4 == h2=8 -- f2=8 == f2=5, forbids d1=5. UP 60. Not too much tougher Dave!